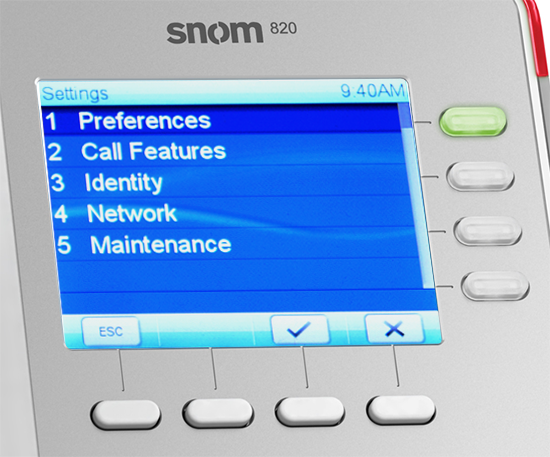 Snom's 8xx series of IP phones depart from the standard matte black finish and gives the user a choice of a matte white as a color option. The devices allow the ability to support upwards of 12 different SIP accounts and features a small color screen which gives the phone an elegant and professional look. 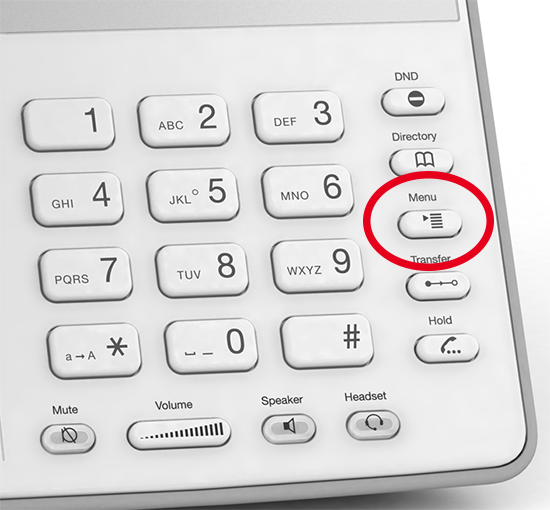 This product is reliable and a convenient IP phone that works well with the Callcentric service. 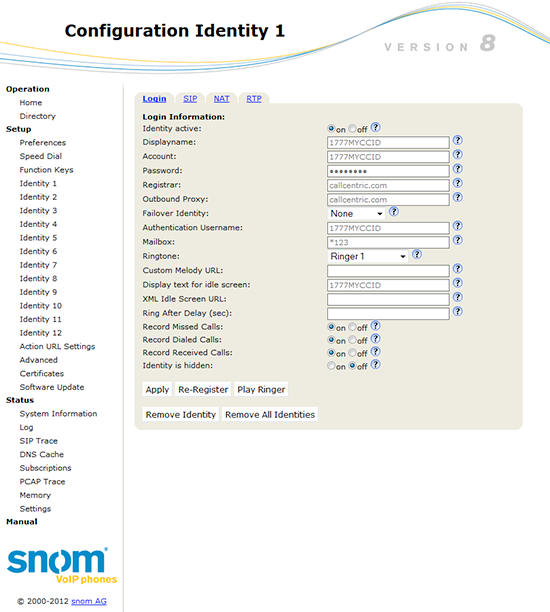 These instructions are based on using the snom 820 software version 8.2.11 in its factory default configuration which is to obtain a dynamic IP address automatically from your router using DHCP, which is how most people have their home routers configured. 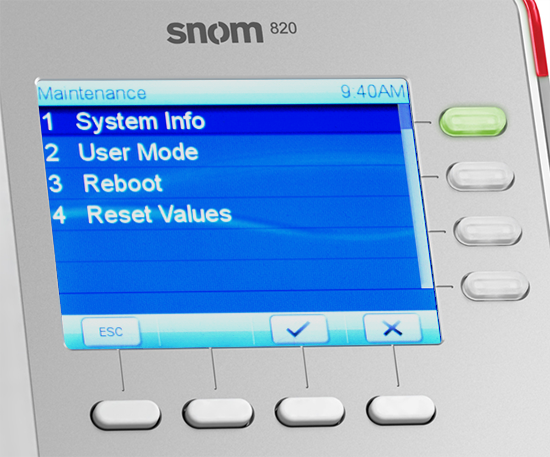 For information on configuring your snom 820 with a static IP address, please refer to the snom 820 user manual. 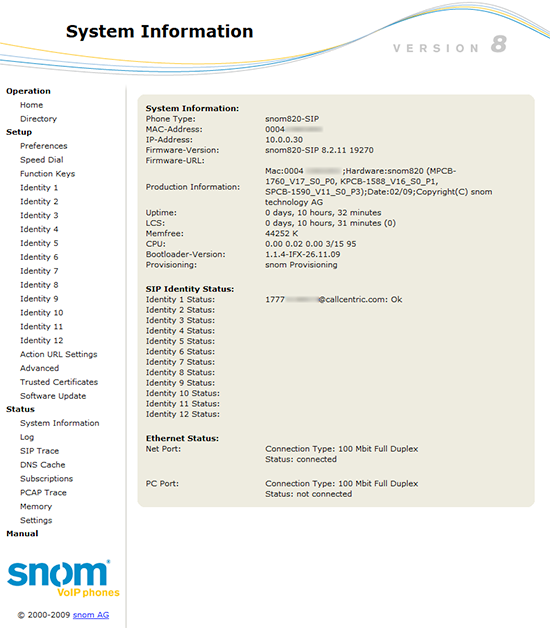 User's intending to use version 8.4 and greater of the snom 820 firmware will not be able use tftp to upgrade and will notice some configuration differences. Specifically configuring your codecs will require using comma separated values. We recommend that you read each step through in its entirety before performing the action indicated in the step. 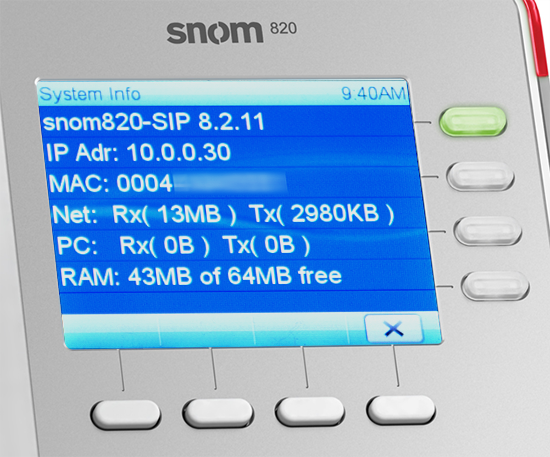 STEP 1 Connect your router with the supplied Ethernet network cable to the snom 820's "Net" port. Finally plug the supplied power cable into the snom 820. 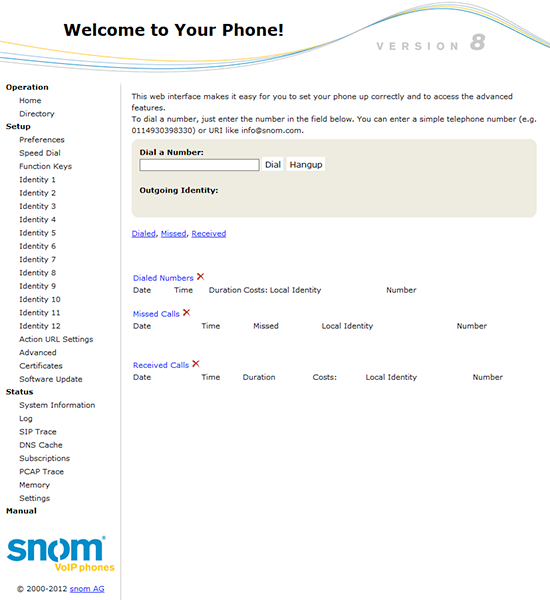 Wait 60 seconds after plugging the snom 820's power adapter for your phone to boot up. STEP 2 To login to your phone open a web browser such as Internet Explorer, or Firefox and enter the IP address you've saw on the phone's interface (I.E. where you would normally enter www.yahoo.com). Account: This is either the default extension 1777MYCCID OR 1777MYCCIDEXT, where 1777MYCCID is the 1777 number assigned to you by Callcentric and EXT is the three digit extension you are trying to register this UA to. For example: 17770001234101 would register to extension 101 on account 17770001234. You cannot register to your account using only the extension number. Password: Enter your extension SIP Password here. Your extension SIP password is the password you created for the extension you are trying to use. You may edit the SIP password you wish to use in by logging into your My Callcentric account and clicking on the Extension menu link and then modifying the appropriate extension. Authentication Username: This is either the default extension 1777MYCCID OR 1777MYCCIDEXT, where 1777MYCCID is the 1777 number assigned to you by Callcentric and EXT is the three digit extension you are trying to register this UA to. We will now check to make sure that everything went ok and that your device registered properly. To do this click on the System Information link on the left side, under the Status category. If you do not see an OK next to the account you configured then please double check your password and settings. STEP 5 That's it! You can now make a phone call. 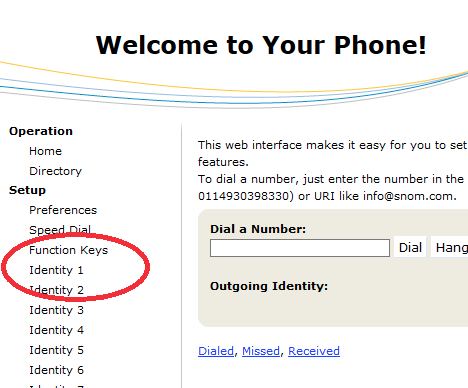 011 + the country code, area code, and number for calls worldwide (you may also use 00 instead of 011).